Mention Singapore and you conjure up images of towering skyscrapers and golden-lit night skies. But few know the cultural and historical background behind this rising star of Southeast Asia. Take a little time to explore this island city, and you’ll be pleasantly surprised by its multi-cultural background and vibrant gastronomy and nightlife it has to offer. 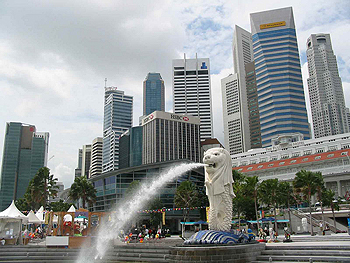 Singapore is made up of a multi-racial society, its population consisting of Chinese, Malay and Indian ethnic races. So it’s no surprise that the cultural and culinary heritage of the country is extremely colorful and diverse. From Chinatown to Little India to the Arab Quarters, you’ll find yourself strolling through very distinctive ethnic enclaves, all within the compact streets of Singapore. It’s easy to see the multi-cultural aspects in every corner of the city. In Chinatown, not only are there massive Buddhist temples and Oriental-style architecture, there is also the biggest Hindu temple in Singapore. Besides temples, restaurants and street hawkers in Chinatown are also some of the cheapest, most traditional and authentic in the country. On Chinese New Year, the entire district is decorated with red lanterns and bright lighting, while festive products are on sale in the bazaars that stay open into the wee hours of the night. Little India provides an interesting peek into the Indian ethnic groups in Singapore. Streets are lined with shimmering jewellery stores, Bollywood DVD shops and Indian handicraft boutiques. Mustafa Shopping Centre is an excellent 24-hour megastore that has everything you can imagine on sale. Come on a Sunday to mingle with the people here, as most of them simply lounge around on the grass and enjoy the day out. Located in the city center, the Arabic quarter is gaining popularity among the young and trendy as more and more alternative boutiques and stylish cafes set up shop here. You’ll find the city’s biggest Muslim mosque and also numerous atmospheric Arabic restaurants and teahouses. Singapore’s gastronomy is one of the richest and most varied in the region. Thanks to the multi-ethnic background, Singaporean cuisine is a concoction of foods from all over Southeast Asia, ranging from traditional Chinese platters to Indian-Muslim mixtures and Peranakan eats. The best places to sample authentic Singaporean dishes are the hawker centres. Each neighborhood in Singapore has its own hawker centers, some with more than one. These hawker centers are basically budget eateries with over 50 or more food stalls selling traditional, local foods. Prices are very affordable, from $2 to $5 for a dish. When in Singapore, you have to indulge in local dishes such as the Chilli Crabs—giant Sri Lankan crabs drenched in hot, lava sauce. Two places famous for Chilli Crabs are No Signboard Seafood Restaurant and Jumbo Seafood Restaurant. Other famous platters include the Hainanese Chicken Rice, Char Kway Teow (flat noodles fried in black sauce), Fried Carrot Cake and Beef Horfun (wet flat noodles drenched with savory beef broth). A trip to Singapore is not complete without a genuine indulgence in the cuisine.